Problem: Prayer ministries produce a prayer diary, a month or year at a time. However, many would like to publish each prayer on a specific date, rather than all in advance. That’s not possible with printed prayer diary’s. However, it’s very time-consuming posting blogs and to social media every day. 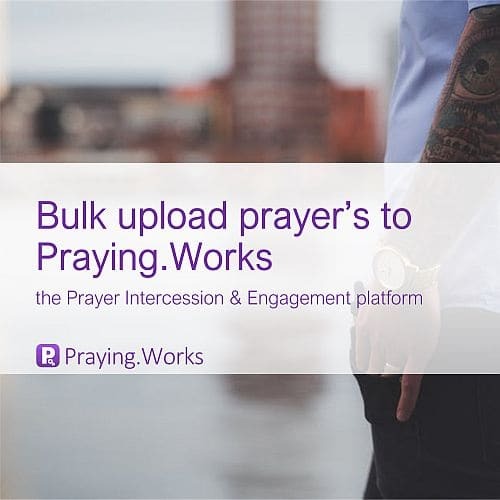 Requirement: Ministries need a way to bulk upload prayers, with a publish date against each prayer. Then each day, the prayer for that specific date is published automatically. And the bonus is ability to share that prayer on social media. Praying.Works provides all the tools you require for your prayer ministry. Get started on Praying.Works today.